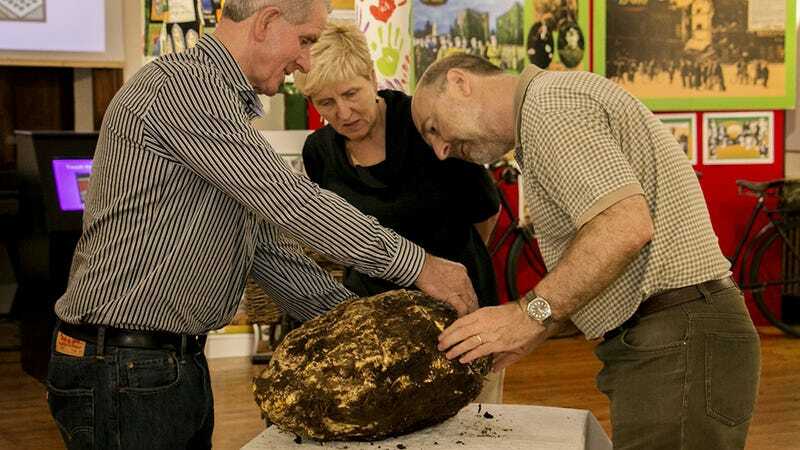 A 2,000-year-old orb of butter weighing 22-pounds was recently discovered in Co Meath, Ireland. Ancient butter experts believe that it was once offering to the gods. It’s also “theoretically... still edible” according to Andy Halpin, one of the Irish National Museums’ assistant keepers. Not a chance, Andy! If the age of this dairy meteor or the potential to piss off some vengeful gods weren’t reason enough not to sample the stuff, consider that the butter was discovered at the bottom of a bog caked in some very old dirt (earthy! organic!). Emlagh bog, where the butter was found, was located at the crossroads of three separate kingdoms back when the butter was apparently buried, and basically no one went there. Halpin described it as an “inaccessible [...] a no-man’s-land.” Presumably the butterball was tossed in, intended never to be touched, and that remained true, until fools like us decided to dig it up. The very old bog blob apparently still smells like a dairy product—a strong cheese, to be precise—and has a crumbly texture. It might even taste good, too. Celebrated chef Kevin Thornton tasted some 4,000-year-old bog butter a couple years ago and then decided to make some aged bog butter of his own. In this case, you shouldn’t expect a taste of this filthy blog. The Emlagh bog butter will live out its days in a refrigerated case in the Cavan County Museum, forever yearning for a traveling toast exhibit.